The Buford Department of Public Safety consists of four separate sections under the management of the Director of Public Safety. The department is dedicated to providing safety services within the prescribed ethical and constitutional limits of the law to the citizens of Buford. To attain this, the dedicated employees of the department enforces all state statutes, city ordinances and regulations in a fair and impartial manner recognizing the judicial limitations of public safety authority. The department’s personnel understand that no public safety agency can operate at its maximum potential without supportive input from the citizens it serves. The Buford Department of Public Safety actively solicits and encourages the cooperation of all citizens to engage with their community so together we can improve the quality of life for all citizens residing in Buford. The Buford Public Safety Director is currently the only full-time sworn state certified law enforcement officer employed in the Public Safety Enforcement Section. The director manages and oversees the day to day operations of all aspects of the Department of Public Safety. The Public Safety Enforcement Section has a broad portfolio of responsibilities which may include, but is not limited to liaison between all county, state and federal law enforcement agencies, responding to natural and technological disasters, internal investigations, employee accident/injury investigations, safety and school security, protective dignitary escorts, interpreting and formulation of policies, regulatory enforcement, storm water mitigation, gas mitigation, responding to emergencies, and court security, budget preparation and implementation. 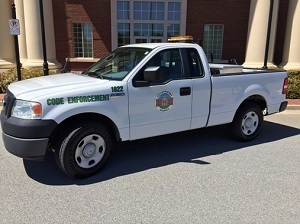 The Code Enforcement Section is dedicated to educating and informing the citizens of Buford of relevant codes and ordinances established for the city by the Buford City Board of Commissioners, which set the minimum requirements and standards regarding property, structures, and business operations which promote and protect the public safety, health, convenience, order, and general welfare of all its citizens. The City Marshal’s Section is responsible for the enforcement of all codes and ordinances established by the City of Buford Board of Commissioners. The duties of the Marshal’s Office also includes, but is not limited to traffic regulation, security at major events, alcohol inspections, property inspections, patrolling city parks, business license inspections, court security, traffic direction at various city school campuses, and the abatement of public nuisances. The Emergency Management Section was established in response to the Disaster Mitigation Act of 2000 which has provided the impetus for states and local governments to undertake natural hazard mitigation planning since October 30, 2000 when the President signed this act into law. This law encourages and rewards local and state pre-disaster planning efforts. Historically it has been proven that the impacts of natural and technological hazards can be reduced, and in some instances avoided all together, if the appropriate mitigation steps are taken before such hazards occur. Through proper identification of potential hazards, the vulnerable areas which may be affected, along with the implementation of the appropriate measures and training aimed at minimizing potential exposures, the negative impacts from these hazards can be greatly reduced. All court dates are held at 9:00 a.m. Please contact the City of Buford (770-945-6761) with questions concerning the Department of Public Safety.